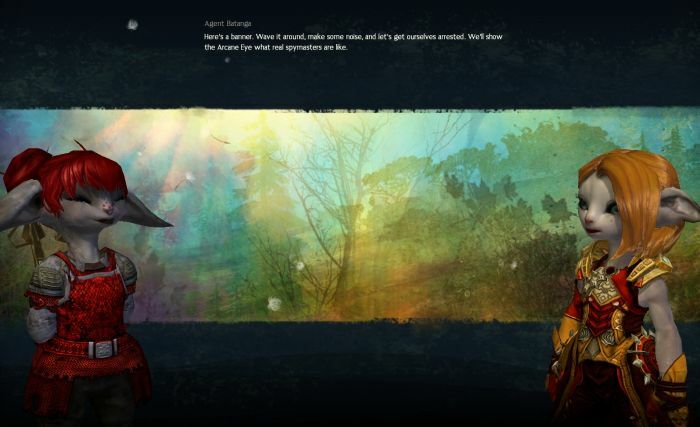 Ding, Level 30 #GW2 #GuildWars2 – Nomadic Gamers, eh! It was a complete accident that I leveled from 27-30, because it was all through crafting. I’m just a hair away from 200 in cooking, and I’m around 150 in jeweler. One of the major complaints I hear from a lot of people in-game is that they’re too low to progress to the next area or to work on their personal story quest. I, have never had this issue. It’s a bit odd to hear of a game that ‘forces’ a player into crafting or harvesting, but if you’re not a fan of grinding events you’ll want to do both of those things. The level 1-15 zone is good for crafting up to 75, so I made it a point not to leave until I had reached 75 in each craft. This meant that I didn’t leave the starter zone until I was almost level 20, well above what I needed to begin the second zone. Once in the second zone I did the same thing, I completed the map, then worked on my story, and then raised my crafting until it was into the next tier. Also keep in mind that there is more than one zone for you to explore. There’s nothing stopping you from taking your Asura over to the Norn starting area and completing their map. In fact you’ll probably want to, sooner or later. Or at least do it with an alt so that you get the achievements for completing the zones. How to tell I’m REALLY enjoying a game? I stop playing alts. This is practically unheard of for me, any one of my long time readers will know that I am constantly flip flopping from character to character, working on multiple things at once. Not true in GW2. I’ve stuck with my Asura Guardian the entire time so far. It’s almost scary. So now I’m sitting at level 30, still not completed the JC I need to do before I move on, and the zone I was questing in is 15-25, so I’m 5 levels above the recommended levels, again. It’s fantastic. Since the game auto levels you down as you meander your way through each zone you will always be level appropriate. It’s an incredibly smooth transition, you probably won’t even notice it, which is exactly as it should be. Leveling too fast? I don’t think so, it’s not that I’m leveling quickly and missing anything, because I’m not, it’s that I have had a LOT of time to play and have been taking full advantage of that. I did spend some money and buy $50 worth of gems. I upgraded my account to the digital collectors edition and I bought some lockbox keys. For a game with 0 subscription what so ever I’m incredibly pleased. I don’t have to worry about unlocking gear. Or levels. Or anything else. I can simply play the game. The entire game. That being said, I DO want to support AreaNet, I do want the developers to make money. Of course I’m going to spend a little here and there to show them that I appreciate their hard efforts, more than just the box cost of the game. So many other games I play are “free to play” with both subscriptions and stores and weird tiers of unlocking that it’s a pleasure to play an MMO that is so simple in its design. Buy a box. Play the game. The end. You can explore, sure, but I have an incredibly difficult time fighting mobs that much higher than me. Even auto leveled down via their system, things hurt. Maybe it’s changed since beta. People were being 1 shot going to events that were too far above. I’ve almost given up trying to explain to people that there’s no need to “complete” an area before you move on or to reach the nominal lower level limit for the next area before you go and explore it. As far as I can tell, and I’ve tested it fairly thoroughly, there’s a soft-cap on how far above your level you can reasonably explore and adventure solo. Into the 30s (as far as I got in beta) it’s about 5-6 levels above you. Beyond that the mobs resist everything so you can’t effectively kill anything and the agro radius increases radically so you can’t really explore either. That still means you can go to a 15-25 area at 10th if you want. There’s no need to worry about not finishing the 1 – 10 area you came from either – when you go back there again when you’re level 20 or 30 you’ll scale back down and everything will give you xp just as if you’d never left – and you’ll get drops appropriate to your real level! That’s just solo. If you think about doing dynamic events, then if you can get there you can do them. In Rift I regularly did Stillmoor events with characters in my 20s and I plan on doing events here as far above my level as I can. Tyria is a world built for roaming.